SportPix, a study from the International Center on Media & the Public Agenda (ICMPA), evaluated 3274 photographs published by 16 major American sports and news outlets as those outlets covered Super Bowl XLVII and the 2013 NCAA final game. Researchers then analyzed the photos to determine how sports news outlets, including ESPN, Sports Illustrated, FoxSports, CBSSports, Yahoo! Sports and SB Nation, together with the hometown newspapers of each team visually portrayed the two events. Even at times of high drama in sports, when media are covering a championship game, only half of what they photograph and publish is of the game itself, according to a study of the photographic coverage of the 2013 Super Bowl and the NCAA men’s basketball championship. A case in point? Researchers found that across the Super Bowl coverage, Beyoncé received more attention than any other personality in the game — more than the coaches, the quarterbacks or any other players. • See here for analysis of the coverage of the games. 2. Across the Super Bowl coverage, Beyoncé received more attention than any other personality — more than the coaches, quarterbacks or players. Beyonce’s performance attracted immense coverage for an event that only lasted 14 minutes — and overwhelming the published photos showed her in very sexualized poses. • See here for more on the coverage of Beyoncé in the Super Bowl. 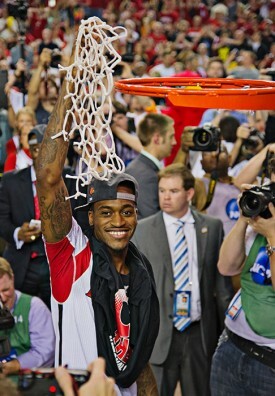 Kevin Ware was the breakaway star of the 2013 NCAA Championship, cheering his team on in the face of a terrible injury. – Sports Illustrated/David Klutho. 3. The iconic players of the championship games were not the MVPs, but the players who came into the finals with compelling stories. When Ray Lewis announced his plans to retire at the end of the 2013 postseason and Kevin Ware broke his leg in the Elite Eight, they became centerpieces of the coverage of the NCAA and NFL final games. Ware was depicted as a gutsy athlete, appearing often in on the sidelines and in the postgame celebration coverage. Photos of Lewis hoisting the Lombardi trophy became the iconic image of the Ravens’ win. • See here for more on how news outlets portrayed the iconic players Ray Lewis and Kevin Ware..
4. News outlets pictured the dejection and disappointment of the losing teams and players — EVEN in photos taken during the game. For both the Super Bowl and the NCAA Basketball Championship, outlets covered the failed plays and post-game disappointments of the losing teams (the 49ers and the Wolverines) much more often than of the winning teams. In fact, researchers never coded a single photo of a Louisville basketball player as expressing negative emotions or frustrations. • See here for more on how news outlets captured the emotions of the games. 5. Across news outlets, the winners appeared in photographs more than the losers — LOTS more. 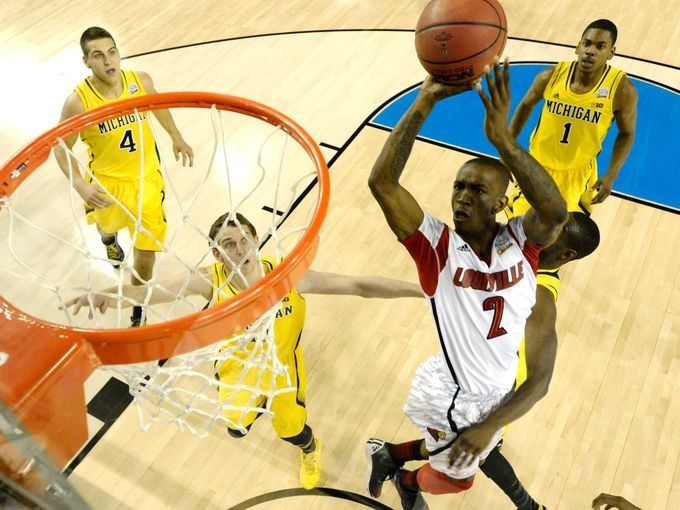 Across the board, the sports news outlets published significantly more photos of the winning teams — the Baltimore Ravens and the Louisville Cardinals. Some of that imbalance was due to extensive post-game coverage, but not all of it. Sports outlets also ran more photos of plays by the winning teams than by the losing teams and tended to show the winning teams in a more positive light photographically, not just after the game, but during as well. • See here for analysis of the photo coverage of the winners and losers.